By Simon Michaux - posted Tuesday, 15 October 2013 Sign Up for free e-mail updates! Something is happening around us. It's been highly visible for five years or so by those who choose to look. It seemed that Australia had missed the troubles plaguing the United States and Europe. The Global Financial Crisis (GFC) seemed to not bother us here at all. Australia was doing well, largely due to the economic performance of the mining industry in a boom cycle. But now the party seems to be over. There are a number of technical reasons for this, which have translated into an economic outcome. As we mine out all of the easy to work deposits, only the harder work deposits are left. Often ore deposits are deeper underground, requiring a greater strip ratio or deeper underground operations. This requires more energy and capital as part of the cost of doing business. Penalty elements in saleable concentrate going to the smelter like arsenic, fluoride or cyanide are not accepted where decades ago they would have been rejected. Often, only countries like China would accept these concentrates due to environmental pollution generated during their processing. Economies of scale need mining operations to double and triple in size for the next generation to be economically viable. 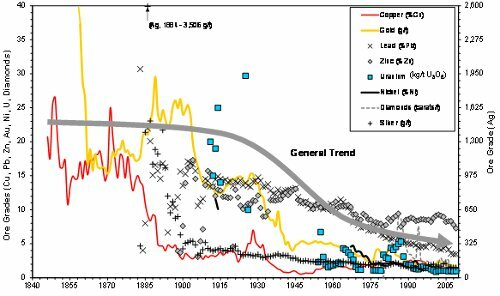 All future operations looked at now are huge low grade deposits, with penalty minerals more prominently present in deposit that prevent efficient processing at ever decreasing grind sizes. The scale of these low grade operations is much larger than what is done now. Energy is the rate determining step mining is no longer the financial bonanza it used to be. Total world fossil fuel supply is close to peak, driven by peak of oil production. Declining oil production in the coming years will create a rising gap which other fossil fuels like gas or coal, will be unable to compensate for. The energy contribution of nuclear fuels is too low in order to have any significant influence at a global level, though this might be different for some countries. Moreover, like with fossil fuels, easy and cheap to develop mines are also being depleted in uranium production effort and cost will continuously increase as a consequence. The industrial systems that each of these energy sources supports is quite different and are not interchangeable easily. That beings said, each of those industrial systems are vital for our society to function. Putting all energy sources together gives a snapshot of our industrial capability. Peak total energy is projected to be approximately in the year 2017, four years away. As all of these sources are only a few years away from peaking and declining (with the exception of uranium), a compelling case can be made that that our society and its industrial sector energy supply faces a fundamental problem, that is systemic in nature. All of the above results in an increase in power and water at a time when power and potable water shortages are probable. This implies that mining in its conventional form will peak and decline, just like production rates of any other non-renewable natural resource. 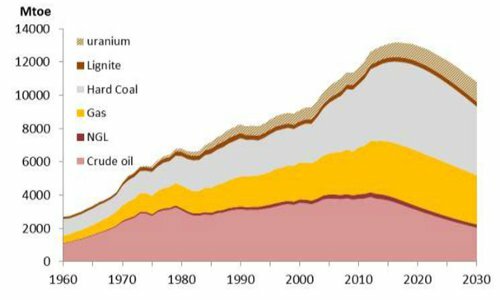 This is a short version of the presentation given by Dr Simon Michaux on peak mining to the Fenner Conference on Environment in Canberra last week. Dr Simon Michaux has a Bach App Sc in Physics and Geology and a PhD in mining engineering. He has worked in the mining industry for 18 years in various capacities.